I HAVE TO SAY THAT FINDING THIS WEB IS BEEN GREAT. I WANT TO THANK EVERYONE THAT IS SHARING THEIR WORK. I HOPE YOU ENJOY MY WORKSHEET ON SUPERLATIVES. YOU CAN USE IT TOGETHER WITH MY POWERPOINT ON THE SAME SUBJECT. 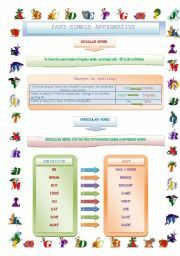 WORKSHEET THAT I HAVE USED AS A COMPLEMENT FOR MY POWERPOINT THAT YOU SO KINDLY DOWNLOADED. 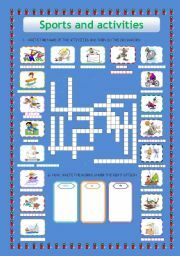 IT COVERS BOTH REGULAR AND IRREGULAR VERBS AND THE 4TH PAGE HAS THE SOLUTIONS FOR THE REGULAR VERBS CROSSWORD. I HOPE IT�S USEFUL FOR YOU. 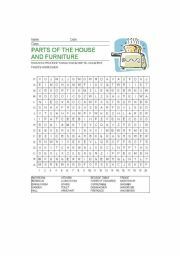 THIS WORKSHEET IS TO REVISE THE BASIC VOCABULARY ON ROOMS AND FURNITURE. IT HAS A PAGE WITH SOLUTIONS. I HOPE YOU LIKE IT. 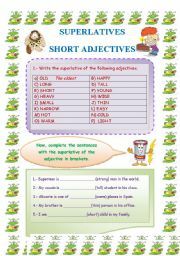 The student�s have to llok ant the picture and complete de sentences. THE STUDENTS HAVE TO FIND THE WORDS GIVEN BELOW. 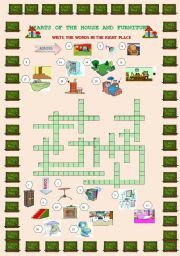 STUDENTS HAVE TO WRITE THE NAME OF THE ACTIVITY BELOW THE PICTURE ANDN CLASSIFY THEM UNDER PLAY, GO OR DO. THEY ALSO HAVE TO DO THE PUZZLE. I HOPE YOU FIND IT USEFUL. A NICE WORKSHEET TO PROVIDE PRACTISE FOR MY POWERPOINTS OF THE SUBJECT. OBVIOUSLY, IT CAN BE USED WITHOUT A POWERPOINT. 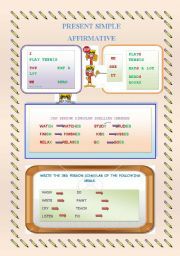 AND FINALLY, THE LAST PRESENT SIMPLE WORKSHEET. HOPE YOU LIKE IT. THIS IS THE SECOND PART OF MY POWERPOINTS ON PAST SIMPLE. THIS TIME IS ABOUT NEGATIVE AND INTERROGATIVE PAST. I HOPE YOU ENJOY THE ANIMATIONS AS MY STUDENTS DID. AND THIS IS THE LAST PART OF MY POWERPOINTS ON PAST SIMPLE. 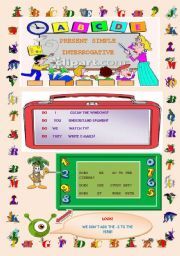 IT�S SOME PRACTICE WITH ANIMATIONS, SO THE STUDENTS CAN PARTICIPATE. I HOPE YOU FIND ALL THREE POWERPOINTS USEFUL. THE IDEAL THING TO DO IS PUT THEM TOGETHER INTO ONE POWERPOINT. 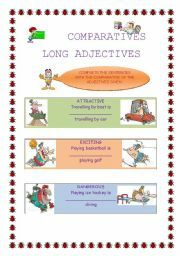 A POWERPOINT FOR PRACTISING COUNTABLE AND UNCONTABLE NOUNS AND THE USE OF A, AN AND SOME BEFORE THEM. I HOPE YOU FIND IT USEFUL. WHAT WERE THE FLINSTONES DOING? HERE YOU HAVE, THE SECOND PART OF MY POWERPOINTS ON COMPARATIVES AND SUPERLATIVES. 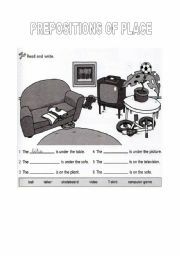 A WORKSHEET WITH EXERCISES SOON WILL BE FOLLOWING. I HOPE YOU AND YOUR STUDENT LIKE IT. I HOPE YOU ENJOY MY POWERPOINT ON COMPARATIVE IN SHORT ADJECTIVES. MORE POWERPOINTS WILL FOLLOW TO COMPLETE THE COMPARATIVE/SUPERLATIVE LESSON. THIS IS THE FIRST PART ON MY POWERPOINT ON THIS SUBJECT. IT HAS SO MANY PICTURES AND ANIMATIONS THAT I HAD TO DIVIDE IT INTO 3 PARTS. SORRY ABOUT THAT, BUT I THINK IT COULD BE WORTHY. THIS IS THE SECOND PART ON MY POWERPOINT ON THIS SUBJECT. IT HAS SO MANY PICTURES AND ANIMATIONS THAT I HAD TO DIVIDE IT INTO 3 PARTS. SORRY ABOUT THAT, BUT I THINK IT COULD BE WORTHY. THIS IS THE THIRD AND LAST PART ON MY POWERPOINT ON THIS SUBJECT. IT HAS SO MANY PICTURES AND ANIMATIONS THAT I HAD TO DIVIDE IT INTO 3 PARTS. SORRY ABOUT THAT, BUT I THINK IT COULD BE WORTHY.